Get ready to go Glamping!!! 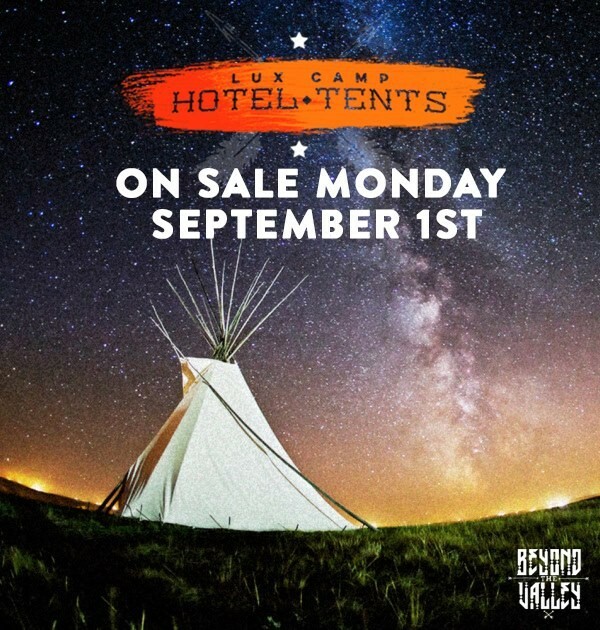 Beyond the Valley is now super stoked to be able to announce the awesome Camping packages that will be available to festival goers. Camping will be set up in the lushest of green fields, with views of rolling hills and the ocean beyond. It will be the festival-goers place to call home and with a range of amazing and unique choices available to each camper allowing them to tailor their experience to suit their every need and budget. Choose from the pop-up luxury hotel with its very own concierge and first class amenities including a daily hangover spa or even your very own Electric City which will be a separate camping area that will be fully powered for those in tents or in camper vans. Festival-goers will be able to connect their appliances or charge a phone; or simply enjoy the stunning surroundings and glorious nature of Phillip Island with GA camping included for all those who purchase festival tickets. At the end of a hard night of partying, sink into the blissful comfort of 1000 thread count Egyptian cotton sheets on your own double bed. The crème de la crème of tents, the King Bell tent is nothing short of incredible with enough room for you and your entourage. The perfect shared sanctuary to provide your crew with all the necessities you will need to come back to after a hard days' festivaling - the perfect home to house your festival crew. + Iced eye and temple pack - goodbye throbbing headache! The ultimate addition to your tent! Holds up to 8 people. Take care of your weary body after a hard day on the green with a complete host of 'care' products topped up with a bottle of The Collection Bar's famous hot sauce. From rehydration drinks to chill-out potions, sunscreens, face masks and more. Let our little box of love pamper and revive your will to live! An electric city Powered Campsite Pass will enable your vehicle to be placed in Electric City with an allocated campsite featuring one 240v, 10amp source. As powered campsite passes correspond to one standard campsite (approx. 4 people) the pass is valid for one vehicle only. With an Electric City Campervan Pass you can literally get into the festival, park your vehicle, plug it into power and you're set! Your vehicle will be fitted to a 240v, 10amp powered supply. A Campervan Pass corresponds to one standard RV site for one vehicle only. Keep an eye on the official website, Facebook and Twitter for more information.